Trivandrum. 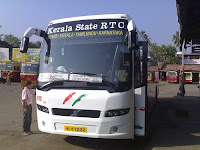 September 1, 2011: Kerala State Road Transport Corporation KSRTC has designed a new project to avail the bus timings to passengers through sms. Transport minister VS Sivakumar took initial steps for the mobile governance project after the completion of the total computerisation of the transport corporation. The project has been created with the co-operation of state it mission. The system works when the passenger sends the details of his journey through sms to the number 537252. He/She receives the details of 20 services and its time schedules via sms.